What’s today’s fashion story?? I shall start with mine. “I absolutely love borrowing from our traditional wear/ culture and fusing it with contemporary silhouettes. It makes for really fun fashion moments! I totally enjoy fusing the two parallels together and coming up with looks that are totally mine! It also gives me the opportunity to proudly portray my African roots! 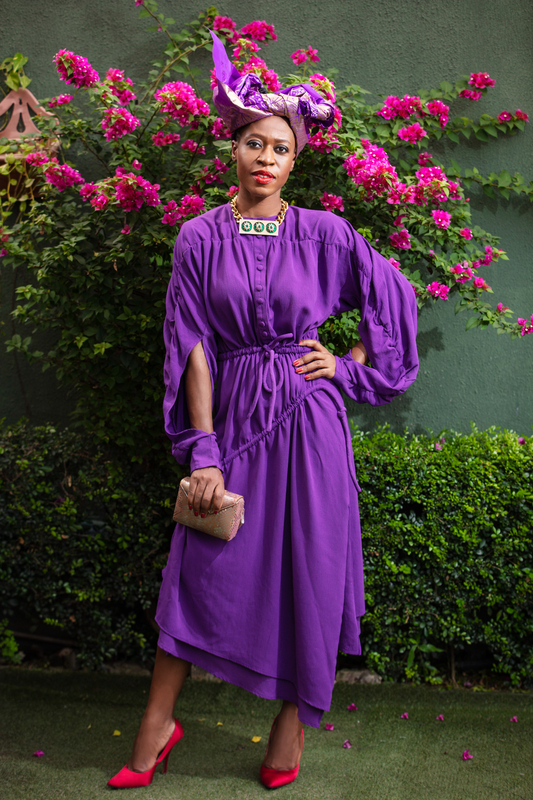 In today’s post, I am dressed in a lavender shirt dress by Meena from Zinkata. I dressed it up with a matching scarf/headgear, a neck-piece from Designer’s Club and Red pumps from my wardrobe. It was such a fun look to create and I would happily wear this outfit to a wide variety of functions. What’s your go-to fashion look? Absolutely stunning! I love the lavender silhouette. Omg, that lavender piece is EVERYTHING!!! Stunning! !